Good news. You don’t have to go all the way down to Goa to find swimmable waters and clean beaches. Maharashtra’s Konkan Coast has some surprisingly nice beaches, too. Faced with a long weekend, Anthony and I were desperate to get out of town for a little R&R. Not that I wouldn’t have minded chilling out at home for three days, doing a little shopping, getting my nails done, etc. But a little beach time also sounded heavenly. Unfortunately, Dussehra weekend crept up too quickly and we had no plans. Air and rail travel to Goa was completely booked for the weekend and we knew a lot of people from work were heading down there, too. (Why would I want to spend even MORE time with co-workers if I don’t have to?) If we could get down there, we would have a place to stay, thanks to a friend’s very nice aunt who was reserving us a room with a coastal view. Alas, the Goa trip was not meant to be. Serendipitously, we got a call around 7pm on Thursday night from our travel agent asking if we wanted to give Kashid Beach a try. He set up the lodging, food, and transportation for us. All we’d have to do is pack and be ready to leave by 7:30 on Friday morning. The price: about $200 for the whole weekend. Sounded like a plan! As planned, at 7:30, our driver arrived. We weren’t too psyched on the fact that the car was emblazoned with the words “Tourist Vehicle.” Such a blatant notice in the States would certainly get you ganked, but in India, apparently, it keeps you from getting hassled by cops wanting bribes. Anyway, we were glad we weren’t doing the driving. I was also glad that our driver spoke very little English – my chance to use Hindi! The Konkan Coast stretches along the Western shore from the state of Gujarat all the way down to Karnataka. We were going south beyond Alibag to a small village called Kashid. 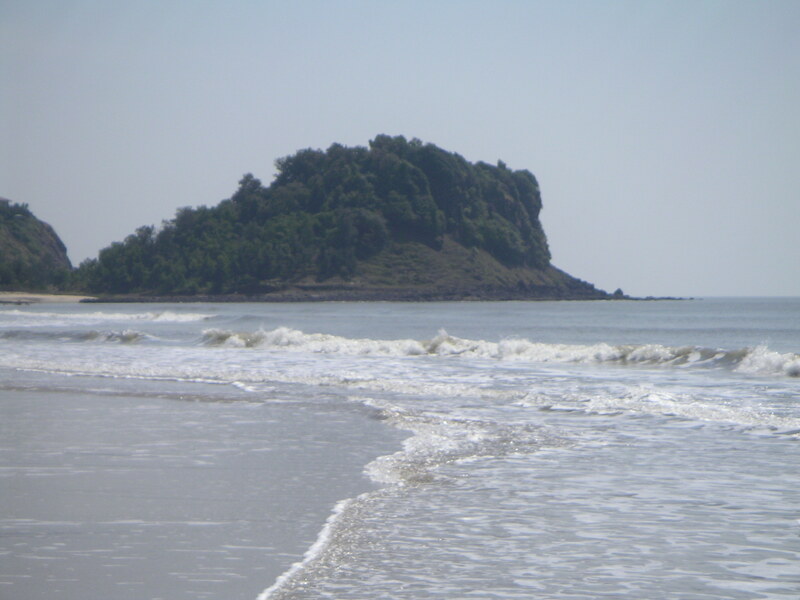 Alibag is accessible in one hour by ferry from the Gateway of India in Mumbai, and then Kashid is about another hour by land. We only learned after the fact that taking the car was not the best move, as it took about four hours on the awful backroads of Maharashtra to reach a town merely 60 km away. So this is my warning to you about the Indian highway system. On the other hand, the drive was not without its fun. We got to spot lots of natural and manmade landmarks, including the “Thumbs Up Pinnacle” (a mountain climber’s favorite, which has a peak that looks like Roger Ebert’s favorite gesture), and random overgrown temples. We also snaked through busy little villages, where locals were selling vegetables, plucking chickens, and preparing for Dussehra festivities. Amazingly, our drive lead us to areas that were hardly populated at all – a feat almost impossible in India. When we rounded the ridge to Kashid, the expanse of the beach appeared and there was nary a soul in sight. Unbelieveable. Shortly thereafter we checked into the Kashid Beach Resort, a genteel, hilltop hotel with about a dozen bungalows. If I were going to write about the place for a guidebook, I’d probably say it was spartan but charming. It had the most basic of amenities, a pretty hard, flat bed and weak A/C, but it did have great food (more on that later) and a backyard with a small lawn. It also had views of the beach, but no direct beach access. We would have to trek down the hill – or drive – to the beach across the street. That seemed to be the case of most inns along the coast. It seems that many people prefer staying on the hilltops in the cool air rather than near the water. We hiked down to the beach almost immediately upon unpacking. It was a hot walk, down a craggy dirt path, across a two-lane asphalt road, and through another path. Even with flip flops on, the beach sand scorched, so we decided to set up camp at the shoreline close to the water. I am not exaggerating when I say that we were the only people on the beach for at least two miles. 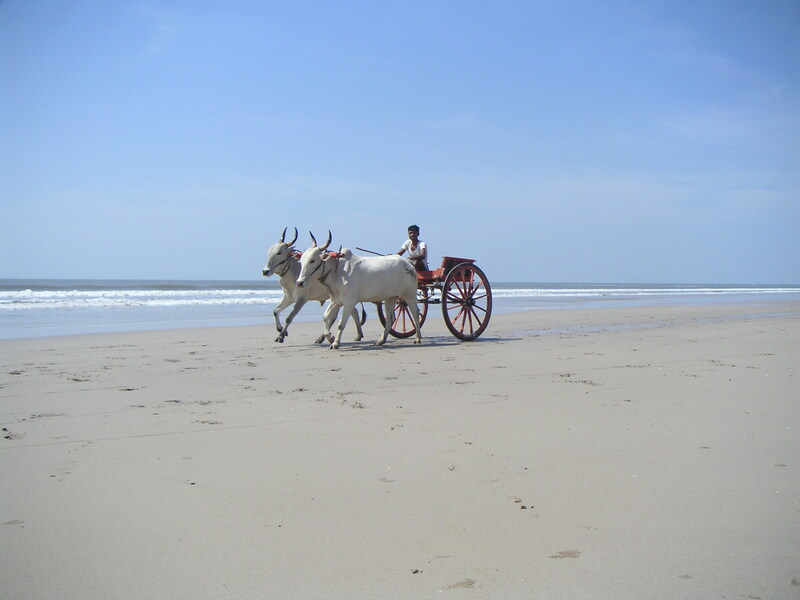 Well, there was the occasional bullock cart driver who would come by and check his fishing nets every so often. But really it was just us, some stray dogs, and a few cows and water buffalo. The Arabian Sea appeared to be quite clean at Kashid, too. We went into the surf one at a time because we’d heard that the undertow can be rough. But the water was pretty shallow and the waves weren’t that harsh. Neither of us really swam in the water with reckless abandon as we would have back home, but we were happy to finally get a chance to christen ourselves with Arabian Sea water. The water also made the 90-95 degree heat much more bearable. After baking in the sun, catching up on some reading, and taking walks down to see the thousands of migratory birds hovering on one end of the shore, we decided to head back to the hotel to nap. What are weekends for, eh? But before that, we had a little snack of prawns sauteed in garlic. Anthony thought they rivaled any Italian-style scampi he’d had in New York. I agreed. The shrimp were fresh, simple, and delicious. After our naps, it was time to do some sightseeing. We hopped into the tourist vehicle and had our driver take us over to Murud, one of the better known beaches along this stretch of the Konkan. From first impressions, Murud is a mostly Muslim enclave. Besides Dussehra, we were also in the middle of Ramadan (Ramzan, here), so there were tons of young boys and older men in their beautiful white kurta outfits and matching skullcaps milling about town. Still there were also a few temples readying their mandals. Everyone was mellow. Heat and fasting will do that to you. It was nearing sunset, so the excitement among the Hindus and Muslims – who were about the break fast for Dussehra and Ramadan, respectively – was very apparent. 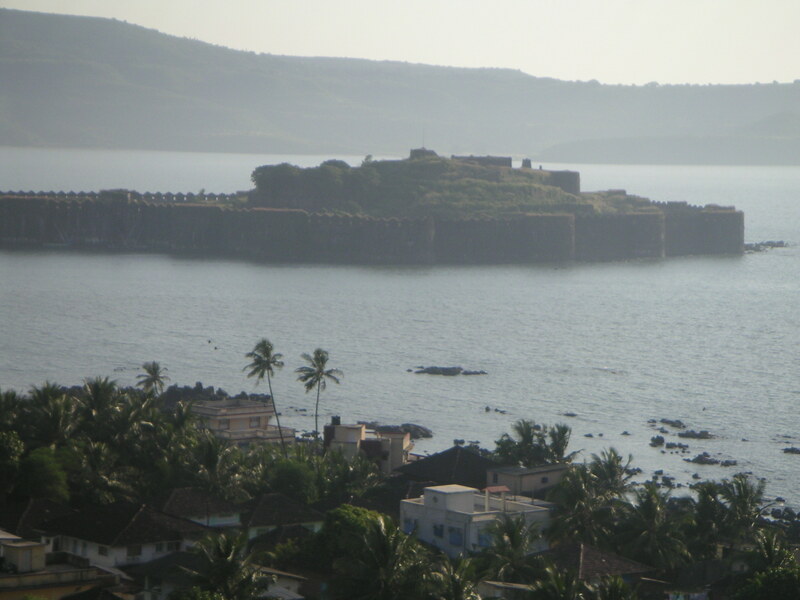 We got out of our car near the heart of town at the port across from the imposing Janjira Fort. We would need to wait for 18 more people to join us for an expedition across to the fort. Or, we could pay a little more and take a boat for two. At Rs 200, we chose the latter option. 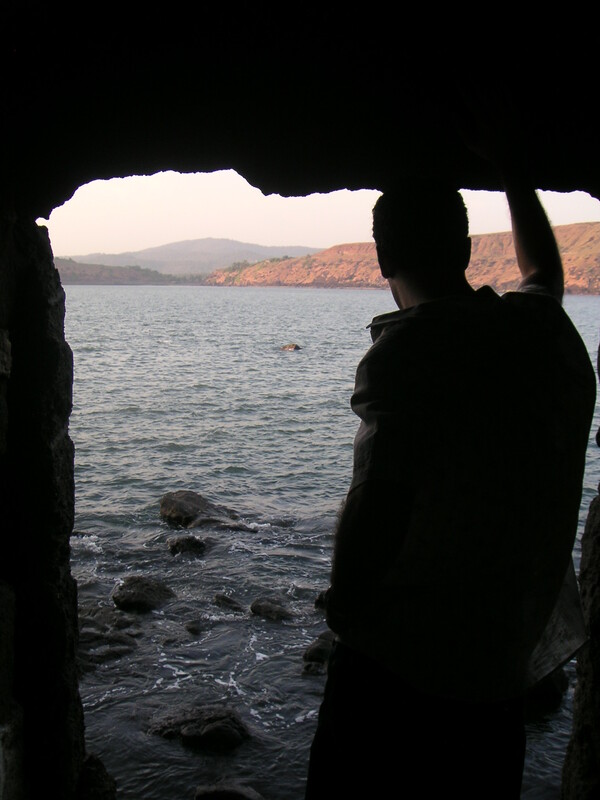 Three men would guide our ramshackle little fishing boat – the Rabbani – over to the Fort. On the way, the younger, brasher of the rowmen offered to be our guide to Janjira for an extra fee. He didn’t speak much English and his Hindi was almost undecipherable (I think he spoke the local dialect Konkanny), but we obliged him and offered to pay a little extra for a guided tour. I decided to take his guidance with a grain of salt when he told us that the fort was “very old – 900 years!” even though I had read it was only about 350 years. But when we dropped anchor next to it, I knew that the boat trip and the guide were going to be worth it. I have to say it almost felt like we were landing on the edge of some “Lord of the Rings” type set. At water’s edge stood this imposing arch with dark stone stairs leading up to the main area of the fort. The place was completely abandoned. And, at this hour, there weren’t even any tourists here. We had the whole eerie place to ourselves. Dusk was by far the right time to be visiting the Fort as the air was cool and the sun was low. The fort stretches 22 acres and for three floors, and houses the tomb of the Siddi ruler who built it, three massive cannons (whose tonnage I forget), niches for bows and arrows, temples AND mosques, marketplaces, freshwater pools (now a bright green from algae), and a meeting hall. All of these things were completely overgrown – I’ve read that the very last inhabitant moved off of the fort/island in 1984 – so the entire place takes on this Pompeii-like silence. In all, the boat ride and tour took about an hour, but it was entirely worth it. 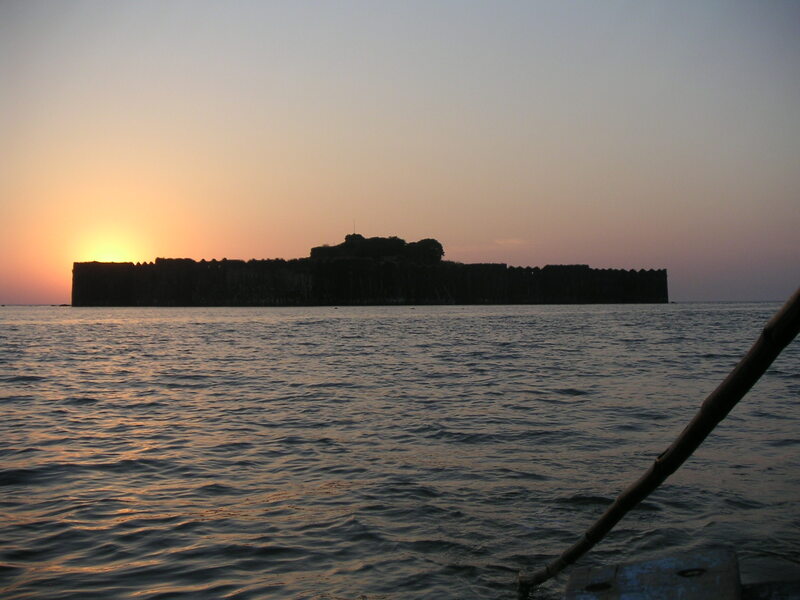 On the way back to Murud, the sun was setting behind the fort and ahead of us were teenagers playing cricket on the beach set to the music of tablas, techno (the bane of modernity), and calls to prayer. Meanwhile, back at the hotel…we were exhausted. It’s amazing what a day of beachgoing and sightseeing can do to a person. So beers and the buffet at Kashid Beach Resort (I’d call it KBR, but Halliburton may not approve) were in order. In between tall bottles of Kingfisher, we chowed on Konkan-style fish (which had been dredged in a very spicy garam masala), chicken tikka, curried garbanzo beans, dal, a number of other vegetable dishes, and fresh naan from the blazing tin drum tandoor. At that moment in time, all was right with the world. Your blogs are very detailed and you seem to capture the essence; intersting to read . It is very difficult to get aclamatized quickly to the local culture and understnad not just the geograpgy but the history which has shaped India over the ages like any other society. Once someone said why Britishers had to leave India? Rest all who so ever came here were absorbed by this society and culture. but then that’s exactly what Brits resited. Your indepth blogs are very very interesting to read; now and again makes me homesick. Never been to Kashid myslef but there are beautiful beaches all along the Maharashtra coast Anjarle, Shreewardhan, Ganpatipule (Ganapatipoolay) to south of Mumbai and Kelwa Mahim, Kihim to the north. Wait till summer and taste the HAPOOS or Alphonso magoes from the souther Konkan, grown on iron bearing dark purple rocks of “Ratna-giri” meaning mountain of Gems. BTW at the southern tip of India Kanyakumari, here you can see confluence of oceans ..blue green and grey. There is an endless list; lots to enjoy and the right season too.